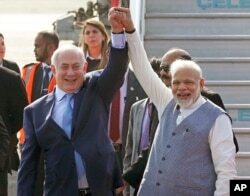 Israel's Prime Minister Benjamin Netanyahu, left, is welcomed by India's Prime Minister Narendra Modi on his arrival at Palam airport in New Delhi Sunday, Jan. 14, 2018. 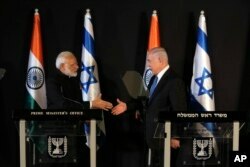 The right-wing Netanyahu told a security conference that India and Israel were two democracies with a natural affinity, but their open and liberal societies faced risks. "Our way of life is being challenged, most notably, the quest for modernity, the quest for innovation [are] being challenged by radical Islam and its terrorist offshoots from a variety of corners," he said. Both Israel and India have long sought to counter militant Islamists — in Israel's case, mainly from Gaza and Egypt's Sinai region and, in India's case, mainly from Pakistan. Away from the public eye, India and Israel have been cooperating against the threat through, in part, intelligence sharing, officials say. "We've discussed in this visit how we can strengthen our two nations in the civilian areas, in security areas, in every area," Netanyahu told the conference. Indian Prime Minister Narendra Modi, left, shakes hands with Israeli Prime Minister Benjamin Netanyahu during their meeting at the King David hotel in Jerusalem, July 5, 2017. Netanyahu toured the Taj Mahal on Tuesday and will also visit Modi's home state of Gujarat and India's financial capital Mumbai. He will join an 11-year-old Israeli boy, Moshe Holtzberg, whose parents were murdered by Pakistan-based militants in Mumbai in 2008, for a memorial event at the Indian financial hub's Jewish center where the attack took place.